The new range of turbo trainers are now out but the main contenders have not changed. Tacx used to hold the mantle for having their fully immersive 3D computer environments, but there is now a new contender to this throne. This best virtual reality turbo trainer 2019 review does not include trainers that only have the ability to ride on films, thus omitting the CycleOps PowerBeam Pro, which is an excellent trainer. Instead it focuses solely on bike trainers that allow you to ride in computer generated worlds against other real-life competitors who you see as 3D riders on the screen. The two turbo trainers in the running are the Tacx i-Genius and the BKOOL trainer. When you ride these trainers the resistance of the back wheel automatically increases when the incline increases, just like in the real world. Also, the faster and more powerfully you pedal the faster you go on the screen. Both of these trainers allow you to compete in online races that really adds to your fun and most importantly motivation to get on your bike when it is not possible to cycle outdoors. Where going to start with price because it is a strong factor in most peoples decision when buying anything. However, both trainers here are not identical so direct price comparisons are tricky but…. Tacx i-Genius RRP = £999.99. Both trainers can simulate inclines of up to 20%, which is right up there as the best on the market. However the Tacx i-Genius uses a more sophisticated motor braking unit (compared to the BKOOL electro-magnetic brake) that can simulate both inclines and declines (up to 5%). This adds significantly to the realism of the i-Genius turbo trainer because just like in real life when you go down hills you can free-wheel and let gravity do the work. Both trainers come with a solid back wheel resistance unit and a front wheel support, as well as connecting online to a cycling community where routes can be shared and races can be organised. Tacx have a longer history in the online environment and thus their community is likely stronger. Also BKOOL is a Spanish company and thus there is a strong Spanish presence in the online community. This being said there are plenty of English speaking racing communities with BKOOL online and thousands of routes that you can cycle or race on from all over the world (over 500,000 routes). 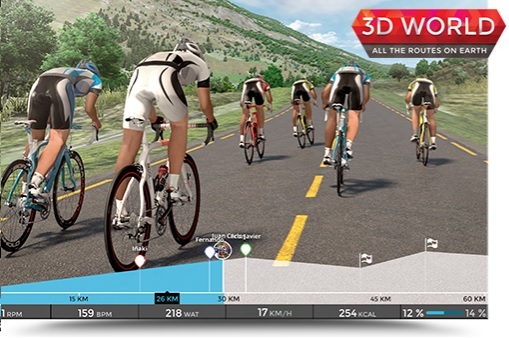 Tacx also has a longer history in the 3D immersive environments, which means their computer generated graphics and physics are likely more polished when compared to the BKOOL 3D world software. Although, from the screenshots above both look incredibly impressive. The videos below show off the VR software of both trainers, but bear in mind that the video of the BKOOL VR trainer is amateur footage shot by someone who owns the BKOOL trainer, whereas the Tacx video is a professionally shot promotional video. The media budget of Tacx probably reflects the higher price tag to some extend of the i-Genius. Start the video at 2mins 18seconds to see the race start (Audio in Spanish). Both the BKOOL and Tacx trainers are solid and reliable. In fact the BKOOL is in the Guinness book of records for the longest time a person (Pierre-Michael Micaletti) has spent on a turbo trainer continuously pedaling (6 days). The BKOOL trainer has a more minimalist design with a solid white colouring (classic) or a solid black colouring (Pro – new for 2019). The Tacx i-Genius takes on a standard trainer form with a forked stand design and Tacx branded colours with a striking blue motor resistance unit. These are superficial factors compared to core features but this trainer will be part of your home so it needs to look good. It’s incredible difficult to choose between these two amazing indoor trainers. Of course the BKOOL is much cheaper in price and this will be a major swaying factor for a lot of you. Is the Tacx i-Genius twice as good as the BKOOL trainer – NO! In fact the two trainers are very close with comparable resistance and high build quality. However, the award to the best virtual reality turbo trainer 2019 goes to the Tacx i-Genius, and the deciding factors are the slightly more polished computer environments (built on several years of development and innovation) and the stronger Tacx community. Also, while the BKOOL trainer is much cheaper you do need to pay for a membership to access all features online. The free BKOOL membership does not include the 3D World software, so you’d need a membership that costs 10 euros a month to get this feature. However, while you do get access to the 3D environments with the i-Genius, you also need a multi-player license if you want to race against real-life people rather than just computer riders, which costs 40 euros a year. Turbo Bike Trainer scours the internet for the very best prices and have found retailers selling the BKOOL trainer for around £300 (saving £29% off RRP) and the Tacx i-Genius for around £800 (saving 20% off RRP). Click here to see the best current BKOOL prices. Click here to see the best current Tacx i-Genius prices.